With a short ride, today's a late start-on the road at 9:05 am. I buy 4 ring-rolls and am charged 2 TL… I think that I got a tourist-price, and am a bit annoyed. 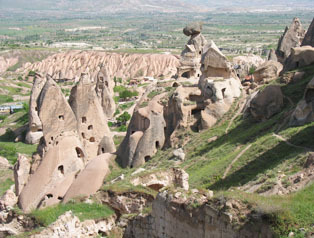 I visit the tourist office just a few blocks down the road and confirm that Göreme was idiot-proof to find. A minute after I leave the tourist office, a van driver, overtaking me on my left, looks directly at me, then cuts in front of my bike to take his right. That pisses me off. It was close! The road edge is rough and I'm hearing more horns than usual - people just using their horns for the hell of it. I can tell I'm slipping into a negative funk. But almost immediately there is a sign pointing to the left: Göreme. 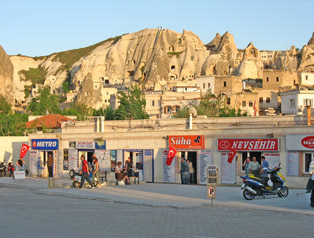 A few kilometers later is a town of Üçhisar, with a sign indicating that I can continue straight to Göreme or I can take a right and head to the town center. I head to the center since I've got such a short ride today, and since there's a possibility that that stone peak in the distance is interesting. Within minutes I'm at an admissions gate for some kind of citadel, embedded in the stone peak. Instead of entering the grounds, I circle around base of the peak, and find that the view from the backside is simply amazing. I park the bike and myself in the shade of one of the carved out caves and simply hang out, soaking-up the view. Only after I've been there awhile do I realize that one of the clouds on the horizon is actually a massive mountain. My LP guidebook indicates that there's a Mount Erciyes 60 kilometers away - I guess that that's it. Life is good! 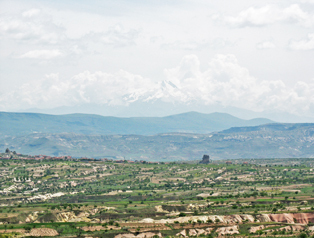 Göreme is just a few kilometers away. It's a steep drop, so hopefully there is another way out, when it's time to leave. I bicycle into town and immediately run into a dozen guys on mountain bikes - American military it turns out, mountain bikers on a weekend break from Adana Air Base. We BS for awhile, and trade dog-incident stories. They're just protecting their territory. I say goodbye, then ride around, unsure where to begin my hotel shopping since there must be dozens of hotels in town. Eventually, I select Blue Moon since it is close to the downtown, but not in the middle of the action. I'm shown a nice bright room, for 30 TL a night, and take it. I go out again, riding around the small town until I spot a "coffee to go" sign at an upscale bakery. I stop there, bemused that I can quickly spend more for snacks here than I spent for last night's hotel room. Wow. So this is what a vacation supposed to feel like! Killer location, the bike as an asset, English is spoken by everyone, clean hotels, clean restaurants - it's so easy! I make an attempt to get a few laundry items done-specifically my lime green biking jersey that now has tire spray marks all over it-but I'm unwilling to pay 5 TL for one top and one pair of socks to be cleaned. Back at the Blue Moon's front desk, the manager invites me to use my room-sink and the hotel's drying area on the roof. So laundry gets done. I call my parents, leaving a message but not mentioning that I've quit my job in California and am calling from Turkey. I go to the bus plaza, just off the downtown, and do some research on how to keep this trip moving. Getting information is easy-there are four kiosks set up, quite similar to car-rental booths in any airport. 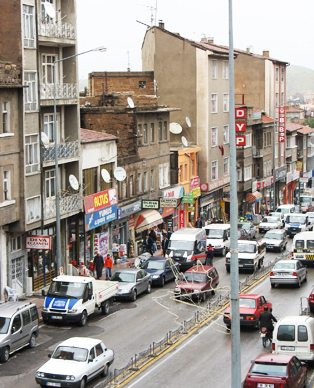 I stop at one, and ask about heading south, specifically to either Antakya or Gaziantep. That booth explains that the Kent Bus booth twenty meters away handles that business. At the Kent booth I add more detail, explaining that I plan to bike another day or so, but need to know where to catch a bus to get further south. I learn that the town of Nigde is a good place to catch the Antakya bus, but that it leaves there once a day, at 4:30 am. Eeeech. But Nigde should be a nice one-day ride from here; so catching a 4:30 am bus is probably what the plan will be. Today's a rest-day. I bike out to the famous "Open-Air Museum," but the bus-loads of tourists take some of the magic out of it. 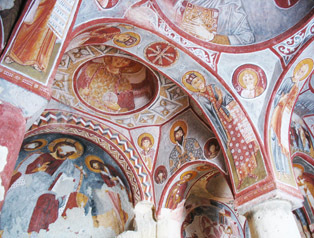 But no question about it-the thousand-year-old painted church ceilings are impressive. I spend the rest of the day biking around the valley. The view from the Üçhisar citadel was unreal. That's Mount Erciyes, peaking through the clouds. Thie same view, from one of the hundreds of caves. 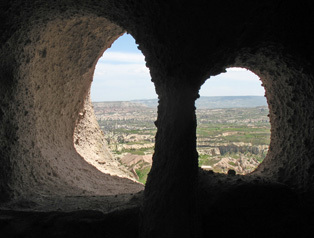 This, believe it or not, is the inside of another cave - one of the churches now protected in the Goreme Open-Air Museum. The Goreme bus station's competing services.